Smart technologies are all around us to make our lives more convenient, comfortable and efficient. One of the emerging industries is the smart wallet and Cascade Wallet by Mani Wonders is leading the pack. 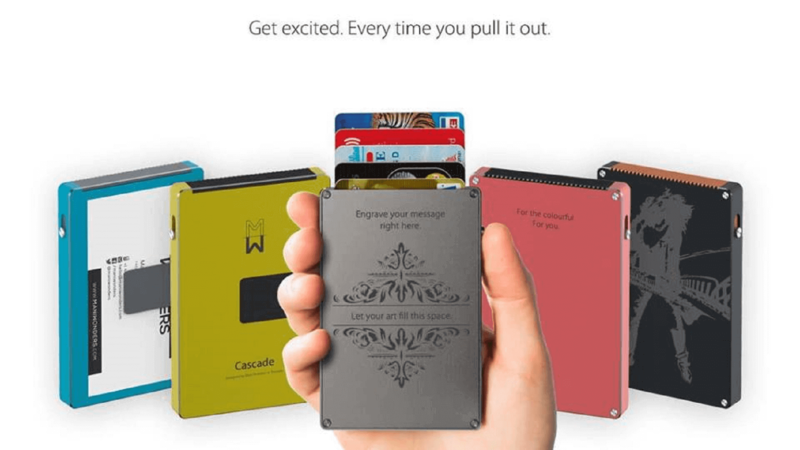 Cascade Wallet is customizable and comes in varying color schemes. It is made out of durable aluminum material and provide laser engraving with your favorite patterns, text, or other things. This makes your wallet truly unique. Cascade Wallet comes with card ejection function which is activated by sliding the side button, and the cards automatically pop up. This is a must have experience! In addition, it comes with a built-in spring loaded money clip where business cards and cash can be stored. Moreover, Anodized aluminum products prevent physical damage and retain the quality and aesthetics of the Cascade Wallet. Most importantly, Cascade Wallet comes with “Firewall” RFID secure protection to prevent and to protect unauthorized access of the personal and financial information. When the wallet is safer, sturider, more convenient, and more intelligent, Any reason not to go with it?